Pangani, northeast of the city centre, has undergone major changes recently as many of its original Indian/Asian inhabitants have moved out to the more upmarket Kileleshwa, Westlands or Parklands areas and a new wave of Indian immigrants from the coast and low-income Kenyans have moved in. The Indian/Asian population lives in modest low-rise apartment blocks and townhouses in the southern part of the area, where roads and public services are generally good, while Africans live in much poorer and more cramped conditions to the north. There is a reasonable selection of small shops, but local business is on the wane. There are no leisure facilities in the area. Eastleigh, further to the east, is inhabited almost exclusively by Somali immigrants and refugees. The area is dusty and heavily congested with people and traffic, especially at rush hour, and the roads are poor. There is limited rental accommodation in ugly concrete apartment blocks; many former residential buildings have been converted into clothing/textile outlets (the main local trade) or rooms that are rented on a daily basis. 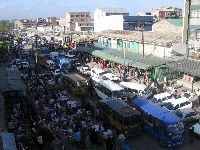 The area is dotted with dukas and small shops and is well served by buses and matatus; a taxi into the city centre costs Ksh300.